"When it comes to interior furniture furnishing, it is no longer just about color and aesthetics. It is about creating a personal intimate space which enhances our quality of life. It is about a Home which ultimately brings out the best in us. It is about moving away from whatever perceived norms or space constraints which were placed upon us." As I noticed the growing popularity of small size apartment which has steadily taking hold in Singapore recently, this thought suddenly came to mind. The steady downward march of the home sizes is fueled by the pressure on the developers to keep the quantum of the property purchase affordable. This is so far the most effective means of coping with rising home prices. However, a smaller unit size certainly certainly poses a big challenge for homeowners like us. Many of us might have veered clear of smaller units due to the misconception that smaller units are simply "not-livable"
Nonetheless, I realized that all we need is a subtle shift in our paradigm of a "livable" home. 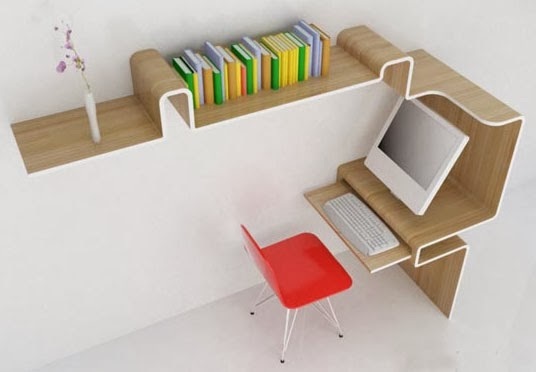 Are you amazed at how one can really maximize the use of very limited space? In order to utilize our space effectively, we have to start to think in terms of multi-dimensional space; a space can function for different purposes at approporate juncture. Apart from this, we have to think of muli-functional furniture pieces too; furniture which pulls double or triple duty to suit the homeowner's needs and purposes. Image from designrulz. 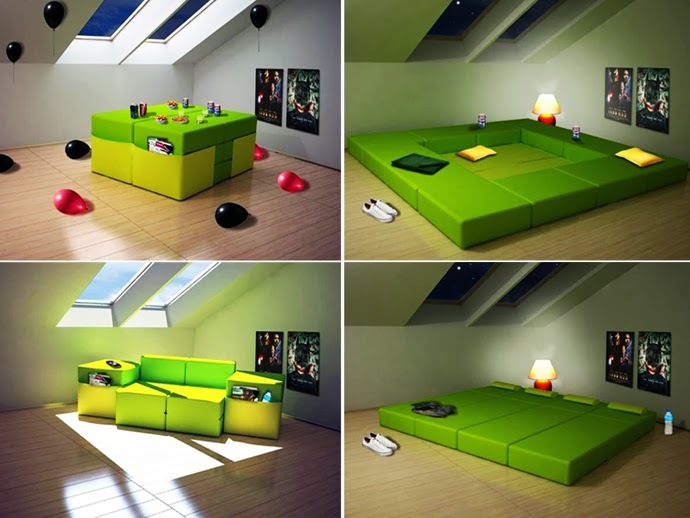 Multiplo modular furniture can be a bed, table, sitting room and much more. 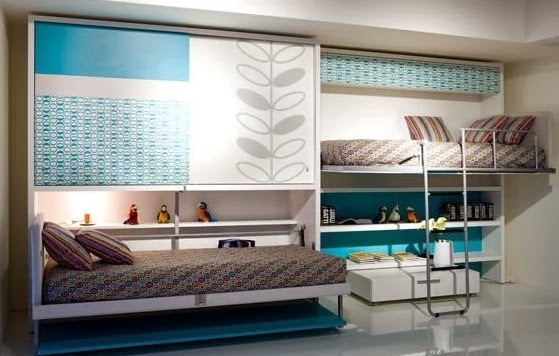 Image from bharatdreamhome. The bed can be tucked away when not in use. Interestingly, there was an initiative from a developer, to showcase that size doesn't matter when a home has been correctly furnished. The pilot involves a family of 3 and the family would feedback to the developer during the trial stay. I would love to findout the outcome of the trial but so far, I am unable to find any more news on this.